I am a hammered dulcimer player and came upon your CD for sale in Cooper Landing Grocery last summer on my first trip to Alaska. I must tell you this story: It became my “theme music” for 10 days as I fished, hiked and drove all around discovering the many beautiful sights and people of Alaska (including Talkeetna…. I met Mr. Stubbs, the Mayor! ). I never did get to see the Aurora Borealis while in Alaska, but I was able to imagine the Northern Lights while listening to your music. On the last evening as the sun was going down, I was sitting in the car in an Anchorage park with your music playing. Another couple drove up. They came over and asked about the beautiful music. I explained what I had learned from the CD jacket and your website. They told me that they had just arrived in Alaska and were starting their vacation. I popped the CD out of the player and gave it to them with the jacket and case, wishing them that they get inspiration and peaceful experiences with it as I had. I never even learned their name. I had downloaded the music to my laptop and my cell phone during the trip, so I’ve been able to still listen to it. Sometimes I listen to it to meditate. Sometimes I listen to it to bring back the smells and feelings of Alaska. As a fellow musician, I really appreciate the tremendous skill and gift that you have in your music…. I’d dearly like to have another original CD. If you could sign it: “To Eric – A Fellow Alaskan Spirit”, that would be very nice. 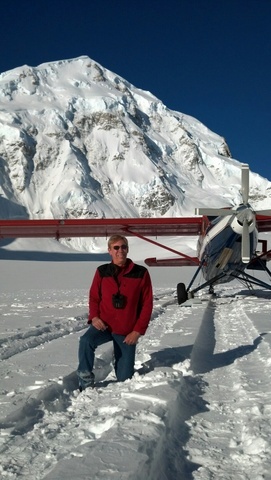 Attached is a picture of me up on one of the Denali glaciers below the peak ……. An unusual crystal clear blue morning. Special moments. A funny little elfin creature jumped up on my left shoulder this morning and shouted loudly in my ear. “IT’S TIME FOR A SALE! A CRAZY SALE! EVERYBODY LOVES SALES!” I nearly jumped out of my skin, giggled fiercely, then conjured up a sale the likes of which I’ve never offered before. $10 per CD with free U.S. shipping… wow! 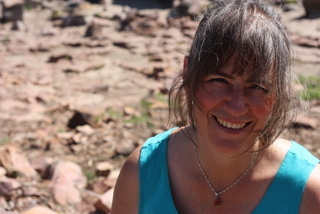 Esther Golton (vocals, dulcimer, flutes, keyboards) was born in Philadelphia and in 1997 moved into a cabin in Talkeetna, Alaska, where she led a simple life and released her two previous CDs. At the moment she lives in New Haven, Connecticut, and has just released a new album with nine original songs and two cover versions. ” Yula “, a song in the Congolese Lari dialect by Borrina Mapaka is driven by rousing Afrobeat , two djembe, shakers and drums, Esther sings and plays dulcimer and flutes on this beautiful World Music Song. “Where is the field” is a great folk-rock ballad with cello, electric dulcimer, flute, fretless bass and drums. 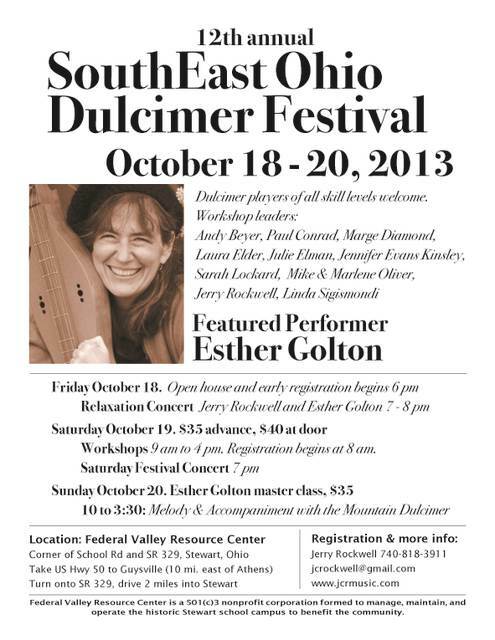 Esther also offers the folk ballad ” Chokecherry ” which she sings accompanied only by the dulcimer . “What Can I Say ” is a funky song with organ, clavinet, bass, drums, dulcimer and cello. On ” Face” Esther thrills us with a great game on flute, dulcimer and piano. Drums and bass provide the pace along with a notable saxophone solo in this rhythmic song . The album ends with the gentle title song “Stay Warm”, sending thoughts to friends up north . Esther Golton has a beautiful voice, her playing on dulcimer and flute is a delight, and the band centered around the co-producers Pat Fitzgerald (drums, percussion ) and Robin Dale Ford (bass , vocals) is excellent. I’m happy to report that just 3 months after being paralyzed by the rare neurological autoimmune illness Guillain Barre Syndrome, I’m 99% back to normal. Hooray! (That’s an understatement!) I feel so very lucky; the nerve-damage aftereffects of GBS often take 1 to 2 years to clear up. My own experience has been far more rapid. On March 9th I’ll play a house concert in New Haven, CT. This is the only show I had lined up pre-GBS that I didn’t have to cancel. I’ll be sharing the afternoon with a local folk-bluegrass band called The Nameless Trio. Last winter Matt, Morgan and Pat employed me to sing (and flute) a very sweet boy-girl duet for their new album Explore!. You can listen to samples (I sing on Track 10, “All The Way Home”) and buy it here. If you live in/near CT and would like to attend the concert, please contact me and I’ll put you in touch with the host, my wonderful friend Louis Audette. The GBS experience definitely rocked my world. In my 47 years before this event, major illnesses were always the “stuff that happens to other people”. Now I truly (and a little anxiously) realize that random, unexpected “stuff can happen” to me or those close to me at any time. Of course I always knew this intellectually, but now I feel it in a tangible way. I’ve talked to friends who’ve gone through big health challenges and they nod knowingly … wide-eyed … at this change in perspective. It’s made me more compassionate towards anyone dealing with health issues. It’s made me want to decide consciously how I spend my days on this beautiful earth. What does this mean for my music? I can’t wait to play my “comeback” concert on March 9th! Then I’m headed to Alaska for the entire summer to sell our house and 10 acres, work for my sister in her wonderful Flying Squirrel Bakery Cafe, reconnect with friends and breathe the wild, open spaces. I’m sure I’ll play a few low-key gigs, and will search out new gift shops to carry my Alaska-infused CDs. It will be a great time for writing new songs, and letting music be music, and savoring everyday life. By the way, I’ve achieved almost half of my 2000 album goal, which means our “mystery painting” is almost halfway filled in. I still have to go out and sing pretty for a lot more people to fulfill that goal so stay tuned. 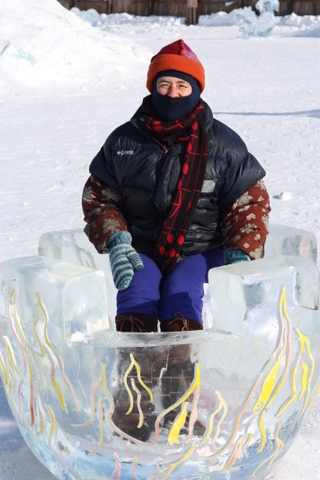 And … stay warm! WOW! My toes are all warm and tingly — and it’s not my Guillain Barre, ha ha. John Apice over at No Depression just wrote this GLOWING review of my work on Stay Warm. Oh goodness … that does feel nice … No Depression indeed! Please “Share” on Facebook, Twitter, email, etc. as No Depression will elevate it to their front page (a big deal for us indy musicians) if enough people click – thanks! 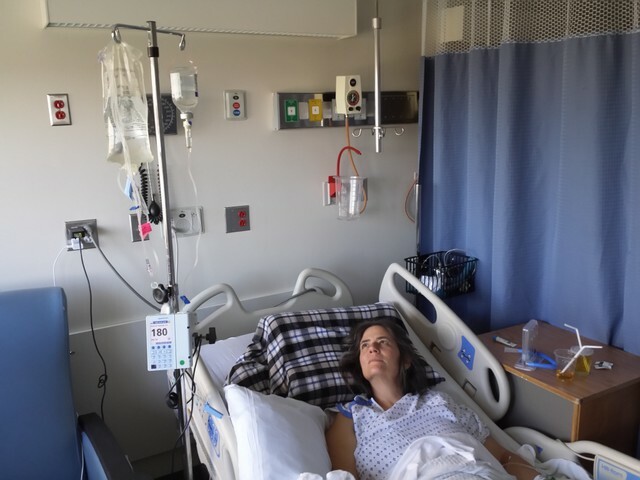 On Thanksgiving day, I came home on a hospital day-pass for the first time since being diagnosed with the rare autoimmune illness called Guillain-Barre Syndrome. (You saying “Huh?” Go here to read my story.) 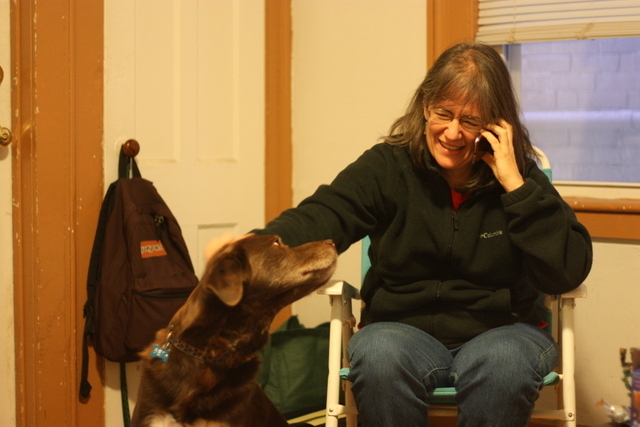 Home was filled with welcome signs and flowers and a very happy dog. 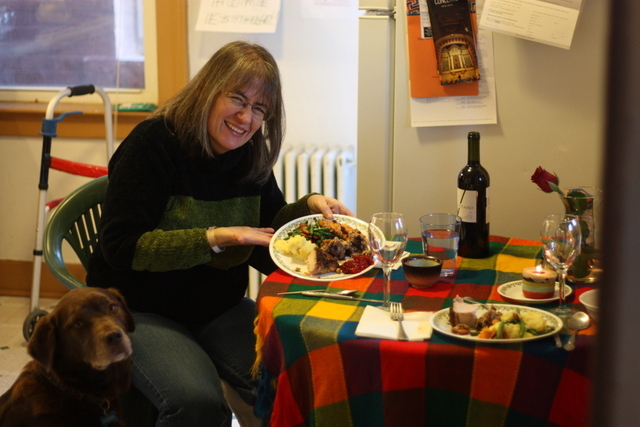 Talk about thankfulness! I have huge appreciation for all the well wishes sent my way via snail mail, email, Facebook and thoughts. Every little bit has helped. Every day I make a little more progress towards normalcy. Now I’ve been discharged from the nursing-rehab facility. I just spent my first wonderful night at home and have started outpatient therapy. I can do a lot of day-to-day things but don’t have much stamina. Still, I’m walking up stairs, cooking eggs in the kitchen and doing my exercises on the floor. Look at ‘er go! Woohoo! Although I continue to feel upbeat and motivated about re-gaining my health and strength, I’m also facing the reality that I’ve had a huge and unexpected setback in my music career. I was so excited about putting together my big winter-long “Stay Warm Tour” as well as working out the final touches on my first-ever radio campaign and attending my first NERFA music conference. All the shows I’d worked so hard to book and rehearse this autumn and during the holiday season had to be cancelled. That was really, really hard. I may not be able to travel and perform right now, but I can still ship CDs from home. If you’ve been thinking about buying or gifting my CDs, now is the perfect time. You’ll give the magic of music … you’ll contribute to my occupational therapy … you’ll warm my hands and my heart. For those who love holiday sales (like me! ): If you order 4 or more CDs, I’ll add an extra CD for FREE. You can tell me which CD you’d like as the extra in the order notes, or via email. The second I get your order, I’ll sign ’em and lovingly pop them in the mail to you and/or to those special someones on your holiday gift list. Click here to order CDs and help get me back to work! Please have a very merry holiday season everyone. Savor the cookies, the neighborhood lights, the people you care for, your own healthful moments. This morning I pushed myself up into a sitting position with my own power. I was shocked and delighted. Progress for sure. 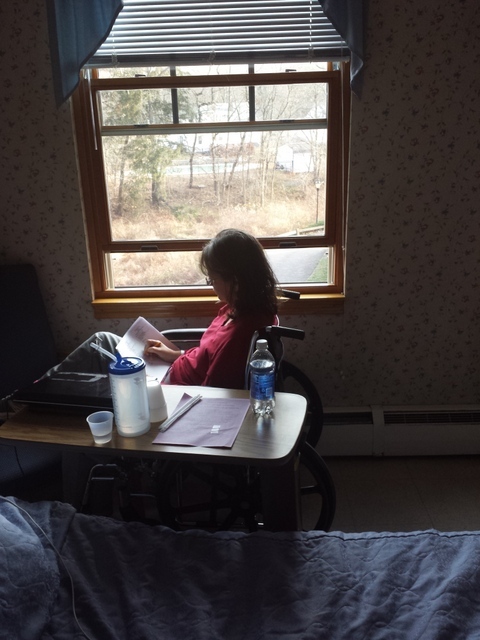 I slid along a wooden board to shift into my wheelchair and Stacey, the nurse’s aide, washed my hair for the first time in over a week. Eureka! Those small things… matter. So many times I’ve recited the mantra “Enjoy each moment – you never know when a curve ball will come your way.” Guess what? Curve ball! Despite emergency hospitalization, paralysis of my lower body, partial paralysis of my upper body and face and having to postpone / cancel all of my upcoming gigs, I feel incredibly lucky. A spinal MRI. Three spinal taps (not the band unfortunately). A fancy shock-the-nerves test called electromyography (EMG). Several neurologists asking me to squeeze, lift, push, pull. Knee reflexes absent. Arm reflexes absent. Nurses and aides guiding me gently to the bathroom … until I can’t walk at all any more. Bedpans. No interest whatsoever in food. Breathing tests every four hours. I need to be turned in bed. Weaker and weaker all over. I have been diagnosed with a relatively rare and completely random condition called Guillain-Barre Syndrome. It’s pronounced ghee-YA-buh-RAY but I’ve heard it pronounced twenty five different ways. In Guillain-Barre syndrome, your immune system — which usually attacks only foreign material and invading organisms — begins attacking the nerves that carry signals to your brain. In the most common form of Guillain-Barre syndrome, the nerves’ protective covering (myelin sheath) is damaged, and this interferes with the signaling process, causing weakness, numbness or paralysis. Here’s the good news: I’ve been handed an illness that 80% of the victims recover from completely. Thank Goodness. And I have incredibly loving, helpful support from Jim, my family and friends. So very lucky. As of now I’m an acute rehab patient at Gaylord Hospital. I’m on the upswing. My nerves are beginning to regenerate, and each day there is notable progress and increased strength. But it will be months or longer for me to regain my body. There’s no way to know exactly how long it will take. I’m going to have to work very hard. Today, holding on to parallel bars and being spotted by Dan, my fabulous physical therapist, I stood for the first time in two weeks. Like the rusted tin-man in the Wizard of Oz, my first steps were clumsy and felt strangely robotic. I am ecstatic. There. Now you know. You know why I haven’t replied to email or returned phone calls … why my gig calendar says POSTPONED DUE TO ILLNESS all over it. Radio play, Ohio tour and more! Hello all – I’m back in New Haven after a wonderful 3-week woodsy retreat in Michigan. The trees have started to turn, and I hope you feel like I do – invigorated with crisp autumn energy. Stay Warm is receiving radio airplay all over the world! With the help of Tracey Delfino and her crew at Trespass Music, Stay Warm has recently been delivered to folk DJs far and wide. It’s gratifying to know that this music I created is delighting random new ears. Here’s a list of radio and web programs that have been playing tracks from Stay Warm. This is a great time to request my songs on your local radio show. If your station doesn’t have a copy, let me know and I’ll send one out, or you can steer them to Airplay Direct. New shows are listed on my tour page, with dates in New Haven and Seymour, CT, the Philly area, Baltimore, and my first Northeast Regional Folk Alliance (NERFA) conference in NY. I’m actively adding more, including travels to further-away regions like the West Coast and the Southeast, so check back. I’ve posted a list of the wonderful array of shops that carry my CDs. If you’re in Alaska and want to pick up a copy of Stay Warm, you can buy copies in Anchorage, Talkeetna, Cooper Landing, Palmer, or Fairbanks. Aurora Borealis is available in many more places in Alaska plus a dulcimer store in Sedona, Arizona. Of course you can also order/download my CDs via my website store. 10 beautiful acres with a fully renovated log home plus 2 cabins and a carport/barn/workshop (give this link extra time to load slideshows). This was the home of Whole Wheat Radio’s webcast and house concert series. 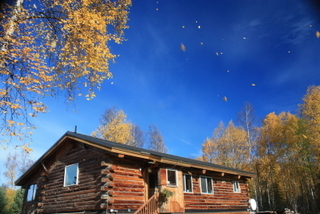 It’s the perfect place to live your Alaskan dream and run a business, school or retreat center. And the 48-foot long cathedral ceiling is covered with wild 1980’s folk-art paintings of Alaska … it’s quite a special place! Thanks, as always for your support. I hope to see some of you at upcoming concerts. I promise to sing pretty for you! 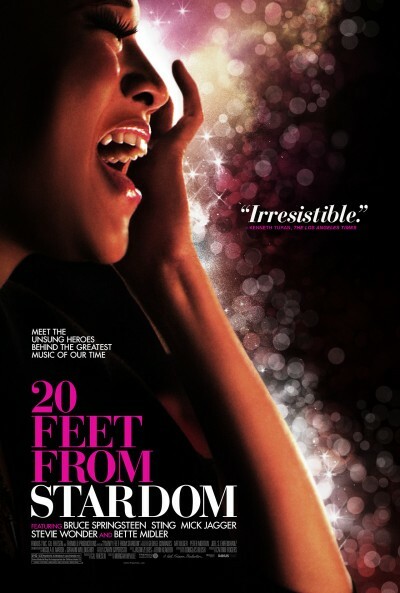 20 Feet From Stardom is a current documentary about backup singers. I found this film moving, inspiring and insightful, both for the music story, and as a metaphor for many life aspirations. (Goosebumps, teary eyes, don’t-I-know-it laughter.) I’ve seen it twice and would see it again. I urge you with enthusiasm – if it comes to your area, go! Here’s a list of cities where it’s playing.